A conversation with Harvey Lewis, Ultra Running National Champion, Vegan, Newtonite. “I average about 90 miles a week across the year but have been pushing closer to 100 miles a week. I’ve commuted back and forth to work both ways running for over 4 years now, so typically it’s important to eat something quick in the morning unless it’s a weekend, and then I can make something after a morning run for a brunch. *First bring the water to a simmer and steep the loose leaf tea for 4 minutes. You could sub 2 tea bags of tea also. After the tea has stepped strain out the loose leaf tea, if using the tea bags just pull out. Now use this flavored base to cook the amaranth in, string every couple min until you have a nice porridge. Next, add the cashew milk and stir in until combined. Finally, finish with the toasted chopped nuts and maple syrup. *Blend all the ingredients in a blender and give it a try. You can always thin out with some more almond milk if needed. 3 Tbsp pine nut “mayo” recipe below. *First take the cooked rice and put into a bowl and mix with the pine nut mayo, grated carrots, grated parsnips, soy, hot sauce, and salt. First, lay the Shiso leaves on your work surface and spread the rice mixture on top. Next, add the slices of avocado to each one then top with the chili oil. Finally add the sprouts or greens to each one. You can pick up and eat like a taco! 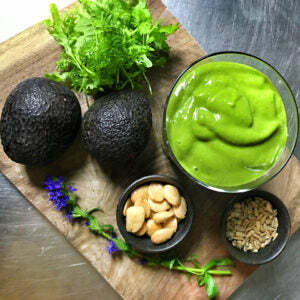 *In a Blender, add the pine nuts, water, olive oil, lemon juice and blend until smooth. The puree will get thicker as it cools. Make sure you season to taste. Chill and then this will last 4 days in the fridge. *Warm a medium size pot over low heat until warm. Next, Sweat the onions and garlic in the olive oil for about 5 min until they soften. Next, add the apple, celery root and mushrooms. When the vegetables start to release their liquid add the spices and the peppers. Finally, cover the vegetables with water or stock and let cook at a simmer for about 20 minutes. After 20 min or until all the vegetables are soft blend in a blender until smooth. Taste the sauce and adjust the seasoning as necessary with salt, pepper, and vinegar. “Now you can roll your favorite vegetables in warmed corn tortillas or even sliced celery root. 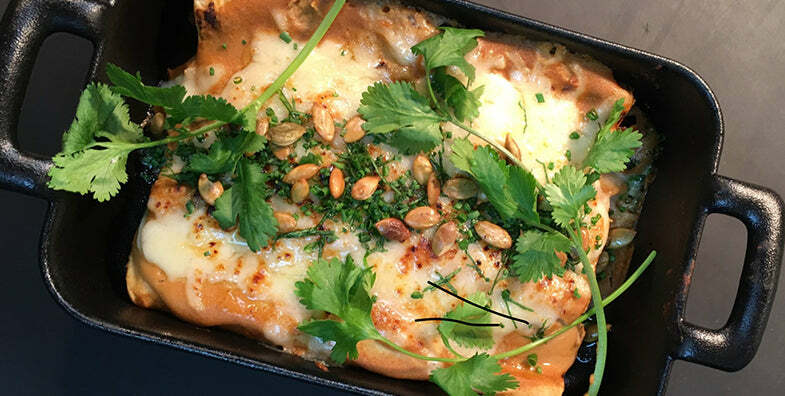 I like cauliflower, mushrooms, celery root ect… Put the enchiladas in a baking dish and cover with the sauce. 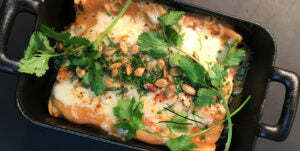 Now you can add some vegan grated cheese, herbs, fried pumpkin seeds then bake in a 350 degree oven for around 20 min. Enjoy or chill and save for the next day. *In a medium bowl, mix the chickpea flour with the all-purpose flour and salt. Whisk in the milk until smooth. Whisk in the olive oil and let the batter rest for 30 minutes. Whisk in the water. *Lightly brush a 7-inch or similar pan with the butter and set it over moderately high heat. Pour 5 tablespoons of the batter into the pan and swirl to coat the bottom. Cook for 1 minute, or until brown around the edge. Flip the pancake and cook for 30 seconds longer. Transfer to a large plate. Repeat with the remaining batter. If you are cooking just for yourself you can reserve the batter in the refrigerator for a couple days. In a medium cast-iron or ovenproof nonstick frying pan, heat the cooking oil over moderate heat. Add the scallions, ginger, and garlic and cook, stirring, until fragrant, about 30 seconds. Add the bok choy and cook, stirring, until the leaves wilt, about 2 minutes. Add the spinach and the salt and continue to cook, stirring occasionally, until the vegetables are almost tender, about 3 minutes more. You can also chill and save for another day. Put down one of the chickpea pancakes on a plate or pan. Next, top the pancake with the cooked spinach and bok choy. Add the sliced avocado Finally, Drizzle the sesame oil and sesame seeds over the top and around. *Harvey Lewis is also an ambassador for ROADiD. Don’t forget, with any purchase made on Newtonrunning.com for the month of November, you can redeem a $10 Gift Card to ROADiD! Check out Justin Cogley’s Instagram to find more recipes. Visit Harvey Lewis’s Facebook to follow him on his 100+ mile running journeys.